Demanding, 6-week training program specifically designed to prepare athletes for the GORUCK Heavy. 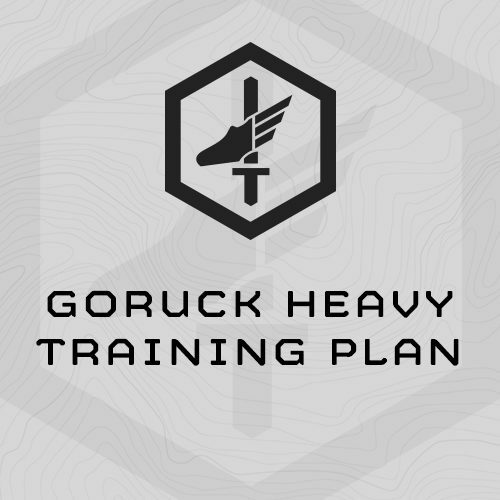 This program designed to be completed directly before your GORUCK Heavy. You’ll start training the Saturday exactly 6-weeks before the Saturday of your event. – 2 minutes max reps push-ups. – 2 minutes max reps sit-ups. – 12-Mile Ruck Run: maximum time allotted is 3 hours 30 minutes. Monday/Wednesday: up to 4 hours. This depends largely on your ruck time. Tuesday: less than 60 minutes. 1. Build Rucking Performance/Endurance – The best way to improving rucking performance is to ruck. During this program you’ll ruck 4 days/week, and at the top of the cycle, will ruck 18 miles in one session, and 58 miles in a week. 2. Build Stamina and Strength Endurance – We’ll build your work capacity through Sandbag Get-ups, long weekend events and stamina sessions aimed at improving recovery and preparing the body for the long event. 3. Build Overall Strength – We focus on hips and legs, but maintain upper body as well. 4. Build Core Strength – Rucking under load and the long events will especially stress your midsection. Every session will challenge your midsection. You’ll come to love/hate sandbag getups and other core exercises. 5. Build Mental Fitness – Saturday training sessions are long, hard grinders which combine distance rucking with multi-modal, work capacity events. Your Saturday training will most closely resemble what you’ll face at the GORUCK Challenge and build/test both your physical and mental fitness. Sandbag. Men will need a 60-pound sandbag, Women will need a 40-pound sandbag. Ruck Pack. Ideally you’ll use the same Ruck to train with that you’ll use during the GoRuck Heavy. You will also need to load it with the same weight, food, and water you’ll carry during the Heavy, so 35# not counting food and water. (5) 3 Rounds, every 90 sec. (1) 5 Rounds, every 60 sec. (2) 5 Rounds, every 60 sec. Ruck 3-Mile at Interval Pace based on SESSION 11 finish time. (1) Ruck 18 miles in 4:30 min. Wanted to take a quick second to send a thank you your way for your advice and programming that allowed me to accomplish a major goal of mine. I completed the GORUCK HTL a few weeks back and I owe a lot of credit to you for helping me to prepare physically and mentally to take on this challenge. Your programming enabled me to succeed during the PT test and continue through the physical aspects of the three events. Across the board your programming made me feel strong throughout and also, I feel, made me more injury resistant. Additionally, I think the nature of your training made me stronger mentally and allowed me to push through some of the darker times when I was tired, sore, and being asked to shoulder weight once again. I would argue that your program not only allowed me to succeed in this, but it also made me a better and stronger team member and it is my hope that my level of preparedness helped me to be someone that enabled others to push beyond their perceived limits. I say all that to say thank you for helping me to achieve this goal of mine and for helping me to be a stronger more capable team member able to contribute to the teams success.